Southern investors are looking north to the Queensland property market as Sydney and Melbourne markets become too expensive to gain a foothold. While the latest BIS Shrapnel report warning Sydney and Melbourne house prices will start to fall in 2016-2017 as interest rates start to rise, Brisbane, the Gold and Sunshine Coasts, are emerging as the more attractive destination for investors. Despite a flat jobs market in south-east Queensland as the mining boom comes off the boil, Brisbane’s median house price of $475,000 is looking a lot more affordable than Sydney ($785,000) and Melbourne ($527,000). It might be a while off from repeating the hordes of Victorians who fled north during the mid-to-late 1990s, but there is definitely an uptick in interest from investors as Australians focus on the Sydney property “bubble” and when it will burst. Gold Coast real estate agent John Newlands said he had been inundated with calls from southern investors in the past few months looking to buy north of the Tweed. “In the old days they used to come up with their suitcases and buy a similar house and have a bag load of money left over,” Mr Newlands said. “There is still a bit of that because Brisbane house prices haven’t caught up [to Sydney and Melbourne] – but we are starting to see more investors come back from interstate, especially in the unit market. They have been absent for a while because things have been so good in their own state. But there are definitely opportunities up here now.” Southern investors are looking north to the Queensland property market as Sydney and Melbourne markets become too expensive to gain a foothold. Mr Newlands said clients had commented about the expensive price tags in Sydney and Melbourne and they were attracted to the higher returns and the buzz and new infrastructure around the Gold Coast ahead of the 2018 Commonwealth Games. Chinese investors have also been piling into the Gold Coast apartment market as well as funding their own developments, with over $600 million worth of Gold Coast development sites sold to Asian-backed buyers in the past year. The BIS Shrapnel report found Queensland would largely be insulated from the dip in house prices in southern states, with further interest cuts later this year expected to make Brisbane homes even affordable. Brisbane's median house prices were expected to grow by a total 13 per cent over the next three years, while apartments will rise by 6 per cent. CoreLogic RP Data released on Wednesday found Brisbane had the highest investment yields of the major metropolitan markets for both houses and apartments. Sydney's valuations are now 80 per cent above Brisbane, according to Corelogic's head of research Tim Lawless. He said the last time that happened in 2002-2003, Brisbane's prices took off. REIQ chief executive Antonia Mercorella said the growth projections for Queensland homes and units was very encouraging. This is despite a sluggish employment market with the state's unemployment rate staying persistently high – it was 6.7 per cent in May – after the collapse of the international coal price. "Brisbane offers some excellent opportunities for owner-occupiers and investors. This is in stark contrast to other markets, such as Sydney and Melbourne, where rapid price growth is a cause for concern," Ms Mercorella said. She said there was also good news for the neighbouring Gold Coast and Sunshine Coast markets with future price growth expected to reach 13 per cent and 12 per cent respectively. The Brisbane apartment market has been hot for some time, with the BIS Shrapnel report saying the Queensland capital will be the only city where apartment prices will be stronger in 2018 than they are today. 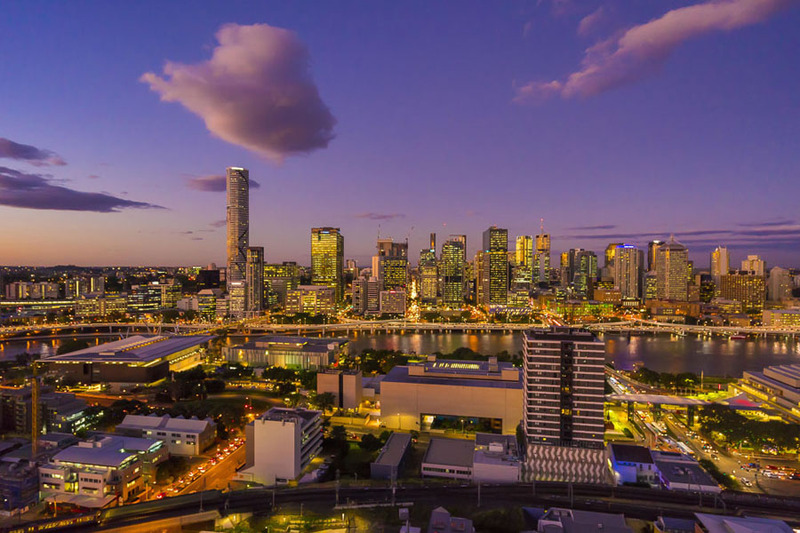 More than $742.9 million worth of apartments were purchased in Brisbane during the March quarter, according to Place Advisory, which is 200 per cent above the 10-year average for the city. Brisbane real estate agent Rob Holcombe, who runs Bees Nees Reality in South Brisbane, said southern investors were chasing bigger yields and cheaper prices in Brisbane. "They are primarily investors and most are buying with a view to capital gain. They see better prospects for returns up here, not to mention it's more affordable," he said. "They come up here to buy our property, they just can't admit to supporting our football team."